Don’t waste your time trying The Fungus Destroyer by ‘James Dean’ and ‘Dr Akara’ because it is a pathetic scam! I won’t even waste my precious time writing a long review about this product because it doesn’t merit that honor. So let’s begin, shall we? Created in May 2016, The Fungus Destroyer claims to be the product that will cure your lingering toenail fungus infection within at least 24 hours. It claims to base on the natural healing wonders of a Thai doctor named Akara Rojjanasukchai. This doctor, according to James Dean, cures fungal infections by means of an ‘ancient’ Thai medicine dating back to the 13th century Lanna Kingdom. Of course he never tells us what this ancient method is and how it works. Instead, he claims that the method is especially effective in treating fungal infections. 1. ‘Dr Akara’ Does NOT Exist! According to the fictitious James Dean, Dr Akara ‘is one of the last practitioners of the ancient Lanna medicine.’ He supposedly owns and runs ‘a small natural treatment center on the outskirts of San Francisco.’ Well if you live on the outskirts of San Francisco, then please help me locate Dr Akara because he is nowhere to be found! I tried searching for this famous doctor and so far, there is not even a tiny indication anywhere that he exists. 2. 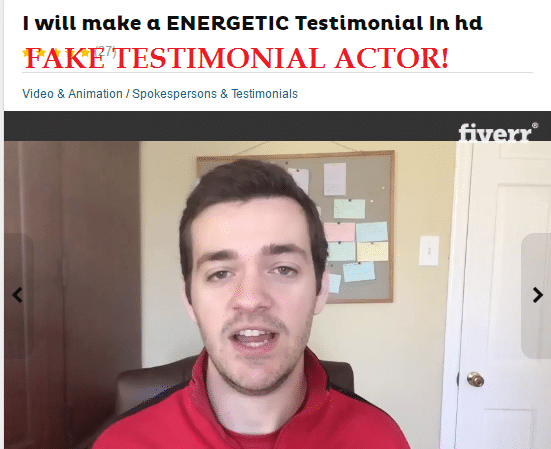 Fake Testimonials with Paid Fiverr Actors! All the video testimonials featured on the Fungus Destroyer websites are fake. This is because the scammer hired actors from Fiverr.com to lie on camera about using the product to cure their nail fungus! Take for example the dude calling himself Jason Williams. He is in fact a popular Fiverr actor named Simplysoccerpro. For as little as $5, you can hire him to say anything you want him to say about your product or service. People like him are constantly used by scammers to create fake testimonials! IMPORTANT: Any product featuring a Fiverr.com testimonial video is a SCAM! Final Conclusion: DON’T BUY Fungus Destroyer. It is A SCAM! This scam tries to use the fact that antifungals Lamisil and Sporanox have serious side effects to scare you into buying their ‘all natural’ product. Don’t fall for it because even though these drugs do have serious side effects, it occurs rarely and not as common as the scammers would want you to believe. So don’t be afraid of using them, as your doctor will test you first before prescribing one of them to you. So save your $37. Also ignore that pop-up preventing you from leaving and offering you a 40% discount. As always, feel free to use the comments section if you have any contributions to make. Thank you! Thanks for the heads up. We need more sites like yours! We need more sites like yours.